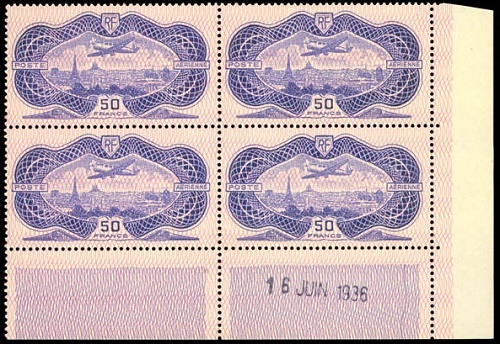 The beautifully engraved airmail French stamps issued between 1936 and 1950 feature views of Paris and other major French cities, an airmail flight milestone, pioneers of aviation, and classical mythological subjects. 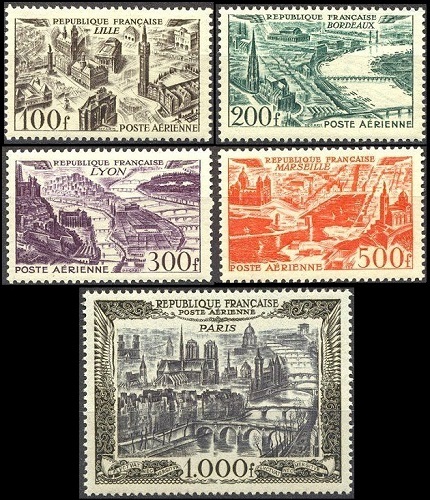 The seven airmail definitive French stamps shown above (Y&T Aerienne #8-14, Sc. #C8-14) were issued during 1936. They are all engraved and perforated 13. The common design features a monoplane above a contemporary panorama of the City of Paris. The 50 Fr. denomination comes in two distinct shades, emerald green and dark green. Only 118,000 of the 50 Fr. denomination stamps were printed, as opposed to the millions of stamps that were printed of the other six denominations. As a result, the 50 Fr. denomination stamps are scarce and very expensive. The stunning-looking 50 Fr. airmail stamp shown above (Y&T Aerienne #15, Sc. #C15) was issued on July 10, 1936. The stamp is engraved and perforated 12 1/2 x 13. The sheets were overprinted with a pale red network, giving them a "banknote" appearance. The design features a Caudron Simoun monoplane, flying above a contemporary view of the City of Paris. 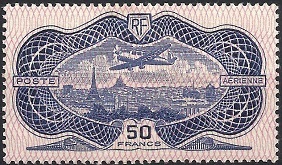 These airmail stamps are not only popular with French philatelists, but also with thematic airmail collectors around the World. The stamps are readily available, but due to their popularity, they have become somewhat expensive. The Caudron Simoun was designed in 1934 as a four seat touring plane. The aircraft, which had set long-distance flying records, was later used as a mail plane by Air Bleu (1935-1940) and as a reconnaissance and light transport plane by the French military. The two commemorative French stamps shown above (Y&T #320-21, Sc. #C16-17) were issued on August 17, 1936 to celebrate the 100th Airmail Flight across the South Atlantic Ocean. They are engraved and perforated 13. The design of the 1.50 Fr. denomination features an airplane above a French Galleon sailing across the ocean. The design of the 10 Fr. denomination features an airplane above a Globe, showing the flight path from France to North Africa, then across the ocean to South America. 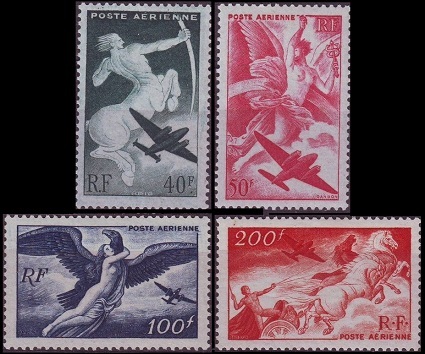 The four mythology-themed airmail French stamps shown above (Y&T Aerienne #16-19, Sc. #C18-21) were issued in 1946 and 1947. They are engraved and perforated 13. 040 Fr. - Centaur. The Yvert-Tellier catalog indicates "Sagittarius", a Centaur credited with being a learned healer and a bridge between Earth and Heaven. 050 Fr. - Iris, the personification of the Rainbow and the Messenger of the Gods. She is also known as one of the goddesses of the sea and the sky. 100 Fr. - Zeus, in the form of an Eagle, abducting Aegina, a Nymph from the island of Aegina. The son of Zeus and Aegina, Aeacus, would become one of the first kings of Aegina. 200 Fr. - Helios, or his son Phaeton, driving the Chariot of the Sun, causing the Sun to rise and set each day. Helios, a Titan, was the personification of the Sun. The later Olympian equivalent was Apollo, and the Roman equivalent was Sol. The 500 Fr. denomination commemorative airmail stamp shown above (Y&T #20, Sc. #C22) was issued on May 7, 1947 to celebrate the 12th Universal Postal Union (UPU) Congress, held in Paris from May until July. The stamp is engraved and perforated 13. 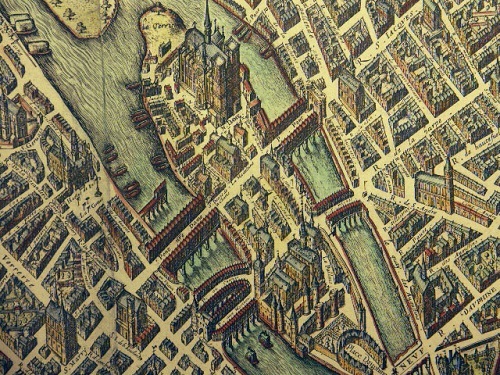 The design features a Dove flying above a view of the the Ile de la Cité. The Ile de la Cité (English: "Island of the City") is a natural island in the middle of the Seine River, the original site which would eventually become the City of Paris. In ancient times, the island was the home of a Celtic tribe called the "Parisii", and after the conquest of Julius Caesar, it served as a Roman Imperial garrison. Since early Medieval times, the island has been home to churches and royal palaces. Significant attractions on the island today include the famous Cathedral of Notre Dame de Paris and the Sainte-Chapelle Reliquary within the Palais de la Cité, the home of Louis IX and the residence of the French Kings until the 14th Century. 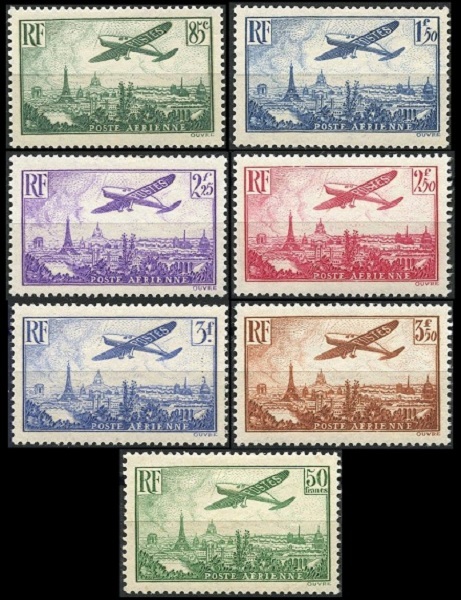 The five pictorial airmail definitive French stamps shown above (Y&T Aerienne #24-27, #29, Sc. #C23-27) were issued in 1949, except for the 1,000 Fr. denomination, which was issued in 1950. They are engraved and perforated 13. The 100 Fr. 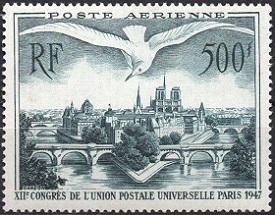 denomination commemorative airmail stamp shown above (Y&T Aerienne #28, Sc. #C28) was issued on June 13, 1949 to celebrate the International Telegraph and Telephone Conference, held in Paris from May until July. The stamp is engraved and perforated 13. 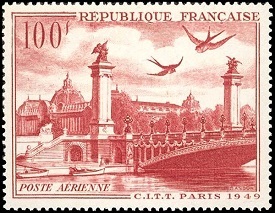 The design features the Alexander III Bridge and the Grand Palace of the Champs-Elysée. The Grand Palace and the adjacent Alexander III Bridge were constructed in 1897 for the Universal Exposition of 1900. Today, the Grand Palace is used as a museum and exhibition hall. 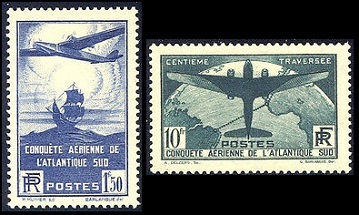 The two commemorative airmail charity stamps shown above (Y&T Aerienne #21-22, Sc. #CB1-2) were issued in 1948 to honor famous French Aviators. The 50 + 30 Fr. 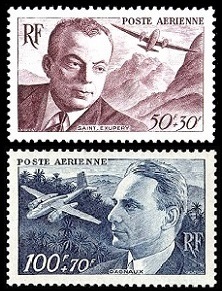 denomination stamp pictures Antoine de Saint-Exupéry (1900-1944), a French writer, poet, journalist, and aviation pioneer. Prior to World War II, he worked as a commercial pilot, flying airmail routes in Europe, Africa, and South America. He was serving with the Free French Air Force in North Africa during World War II, when his aircraft disappeared over the Mediterranean Sea. The 100 + 70 Fr. denomination pictures Jean Dagnaux (1891-1940), a French flying ace during World War I. He was awarded the Legion of Honor and the Croix de Guerre. Dagnaux again joined the French Air Force in 1939, and was commissioned as a Lieutenant Colonel. While on a reconnaissance mission, on May 17, 1940, his plane was shot down and he was killed. The surtaxes on both of these stamps benefited aviation pioneering programs. The Clement Ader "Avion III"
The 40 + 10 Fr. denomination commemorative airmail charity stamp shown above (Y&T Aerienne #23, Sc. #CB3) was issued in February 1948 to celebrate the 50th Anniversary of the First Flight of Clement Ader's "Flying Machine". Clement Ader (1841-1925) was a French inventor, engineer, and aircraft designer, credited by many with being the Father of Aviation and the Father of Powered Flight. The French word AVION was actually invented by Ader. He nicknamed his twin-engine, bat-winged, flying machine the "Avion III", based on the Latin word "avis", meaning "bird". Today, the French word "avion" means "any machine that flies", or otherwise, "airplane". Here in the USA, over the years, everyone has seen airmail letter envelopes with the printed French words "Par Avion" or "By Airplane". Other words we use that are descended from "avion" are "aviation" and "aviator". 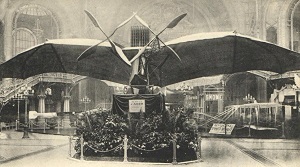 The bat-winged flying machine referred to by the 1948 anniversary was designed by Ader between 1892 and 1897, and it was called the "Avion III". Ader insisted that the Avion III flew about 300 ft., but that has never actually been substantiated by witnesses. The Avion III had two propellers and was powered by two lightweight steam engines. Ader's earlier, single-engine, model was called the "Éole", the French word for "Aeolus", the mythological ancient Greek "Keeper of the Winds". The surtax on this stamp benefited aviation pioneering programs.